A dramatic 90th minute equaliser by Leon Barnett secured a share of the spoils for Wigan after they had trailed 2-0 to Doncaster at half time. Somewhat against the run of play the Yorkshiremen had stunned the home crowd with goals by Theo Robinson and Chris Brown. But following the introduction of Marc-Antoine Fortune and Jean Beausejour in the second period the Latics were much improved. After Fortune was brought down in front of goal, Shaun Maloney stepped up to produce an exquisite free kick to pull a goal back and then came the late equaliser by Barnett. The FA Cup holders started the game strongly and attacked the visitors with some vigour. Grant Holt headed over the crossbar and then had a near-post volley saved by Rovers goalkeeper Ross Turnbull. The Ex-Norwich striker Holt, felt he should have been awarded a penalty after he was bundled to the ground by Doncaster right-back Reece Wabara but referee Boyeson waved away the appeals. Wigan were causing numerous problems for the Rovers defence and Chris McCann broke through only to fire straight at Turnbull, and then Shaun Maloney’s cross-shot came off the far post. But Doncaster took a shock lead on 25 minutes when Robinson turned adroitly in the penalty box to fire past Scott Carson. Wigan were still having the majority of possession but Rovers doubled their lead on 43 minutes when Brown nodded in Bongani Khumalo’s cross from close-range. Some of the home ground booed off the team at half-time and no doubt manager Owen Coyle issued some stern words to the players in the dressing room. But almost from the restart Rovers nearly increased their lead when Khumalo crashed a header against the post. 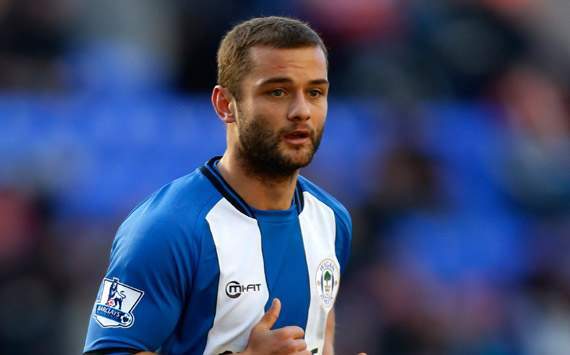 It was a major let off for the Latics as they set about trying to reduce the deficit. Shaun Maloney started to pull the strings as Wigan went in search of a goal and it was the little Scotsman who pulled a goal back on 57 minutes with a superb free kick curled into the corner of the net. Wigan increased the pressure on the Rovers goal and created numerous opportunities but partly due to some poor finishing and last-ditch defending they survived until the 90th minute when Barnett stepped up to score the vital equaliser. Even then the drama was not quite over as Rovers nearly snatched an unlikely winner when substitute Billy Paynter hit the woodwork. Despite having the lions share of possession and creating more chances than their opponents Wigan will be relieved to have taken a point from a game they could easily have lost. The club have had a mixed start to their Championship season with an emphatic win at Barnsley and two disappointing results against promoted sides Bournemouth and now Doncaster. Owen Coyle will be particularly frustrated by the poor defending which has resulted in a lower than expected points tally. The manager will be expecting a significant improvement in this area for the upcoming home matches against Middlesbrough and Nottingham Forest. This entry was posted in Chris Brown, Doncaster Rovers, Leon Barnett, Shaun Maloney, Theo Robinson, Wigan Athletic and tagged Chris Brown, Doncaster Rovers, Leon Barnett, Shaun Maloney, Theo Robinson, Wigan Athletic. Bookmark the permalink. “I’ve seen it back and it’s the biggest stonewall penalty you’ll ever see in your life,” said Coyle.